La Colosa is a world-class porphyry Au project located in Colombia, currently undergoing pre-feasibility analysis. As part of collaboration between AngloGold Ashanti and the AMIRA P843A GeMIII Project, the application of emerging geometallurgical characterisation testing and modelling tools has been incorporated in early stages of project development. The aim of the geometallurgical study is to map inherent comminution variability across the La Colosa deposit providing information critical for mine/mill design and optimisation. In this study, site-based data incorporating multi-element assays, QXRD bulk mineralogy measurements, EQUOtip rebound hardness data, and routine geological logging information from 59 diamond drill holes has been integrated with a range of geometallurgically specific comminution test (i.e. GeMCi, A*b, BMWi). 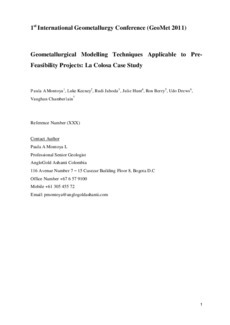 The work in this paper demonstrates the integration techniques used at La Colosa to link routine data acquisition methods with comminution test results through the development of proxy support models. The integration incorporates a range of statistical techniques including principal component analysis and regression modelling. By creating proxy models, comminution index estimates can be propagated into the geological database enabling comminution processing domains to be defined. These domains provide the first spatial representation of comminution performance and variability at La Colosa and can be compared against traditional geological domains. This study provides the foundation for ongoing comminution characterisation as the La Colosa project evolves through project cycles into an operational mine.